"Fat people don't have feelings." "Fat people are gross." "Skinny people are ugly." When blogger Jes Baker of "The Militant Baker" was perusing Google, these are some of the auto-completed searches she found. But instead of stewing, she turned her frustration into a powerful project. Baker was inspired by a recent United Nations poster campaign that used Google autocomplete searches to show how sexism manifests itself online to create a similar project about body-shaming. The resulting photo series, "Bodies Aren't Ugly. Bullying Is," is incredibly powerful. 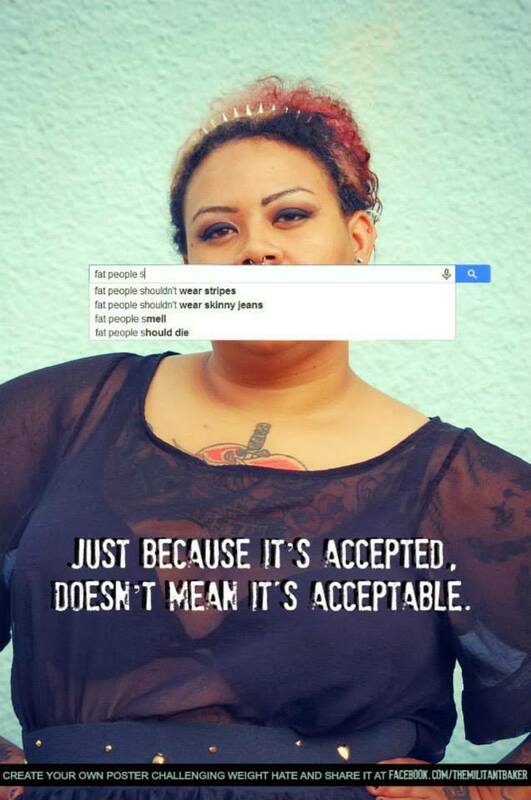 I may be used to reading this kinda junk by now, but that doesn't make it any less alarming when the top searches for fat people include things like: fat people are disgusting, don't have feelings, deserve to be bullied, and should die. This immense hatred baffles me; a persons body shape is so benign that it only affects those who inhabit it. Yet, it is socially acceptable to hate, loathe, harass, antagonize, persecute and bully a person based on a clothing size. Baker's juxtaposed images of people with Google autocomplete searches criticizing their body types. She shared the images on her Facebook page and invited her followers to create and share their own posters and slogans. At the time of writing, the album had received over 500 submissions. As long as we continue to demonize and degrade one body type, we will never reach true body acceptance as a society. And until we reach true body acceptance as a society, we will continue to see low self-esteem, depression, eating disorders, sabotaged relationships, employment inequality, sky high suicide rates, and all sorts of other social infirmities. No more please. No more. Check out one of Baker's other projects -- the first ever Body Love Conference, happening in Tucson, AZ on April 5, 2014.